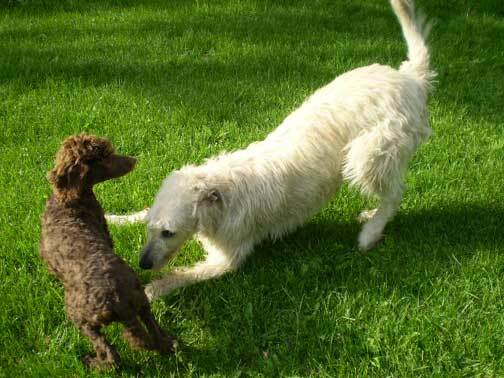 Royal Standard Poodle - Fritz at home in Holcombe, WI with her new Wolfhound friend Calamity Jane. Fritz is going to be a service dog for his master. My owner's happy - "I just love this puppy!! ...I leave around 2:00 for work and don't get home until 11:30 and he has not made a single mess while I'm gone." 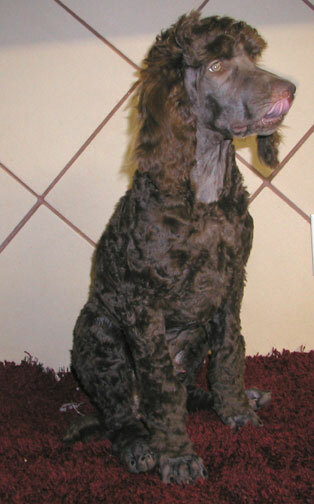 See available puppies like Royal Standard Poodles - Fritz I thought I'd develop the form below to help with pet updates. Here you can fill in the weight, height, and what you two/family enjoy doing together. Upon sending it, you will receive an email from me that you can reply with new .jpg pictures attached (around 40kb please). Hopefully this will be an easy trigger instead of trying to find my email address.